Cushing, Oklahoma, is home to a variety of retail, restaurant, industrial, professional and service businesses. 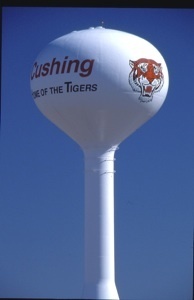 Known as the “pipeline capital of the world” because of its long history and present service as one of the largest oil storage locations in North America, Cushing’s economy has weathered economic ups and downs with more resilience than many similarly-sized communities. Cushing’s location at the crossroads of Highways 33 and 18 means it serves a large population and attracts potential customers from across the region. The city is easy to do business in and with, and many of the forms or information documents you might need are located on this website. This website is currently under construction. Please check back soon for additional information on opening a business in or relocating a business to Cushing. Current demographic information is available in the Economic Development section of this website. Download the 2014 Retail Snapshot for the Cushing trade area.